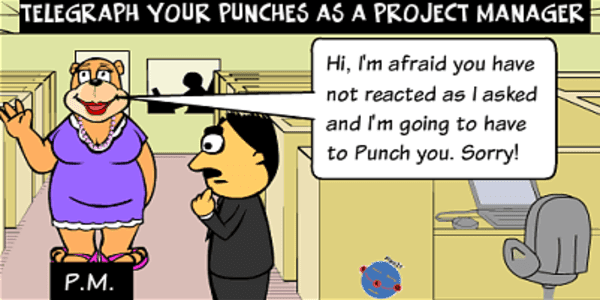 Sometimes as a Project Manager you need to throw a "Project Punch" but not a literal one please! In this post I describe why and how I will do it. But in all circumstances I will aim to telegraph the punch first as to hit out without the recipient knowing it is coming isn't good for long term working relationships within the Project. 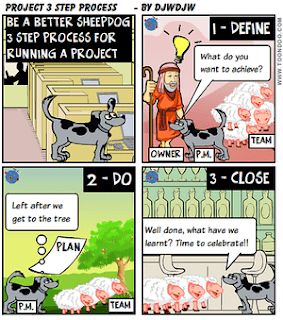 As a Project Manager you typically need to achieve things through team(s) and individuals that you have no line management responsibility for. 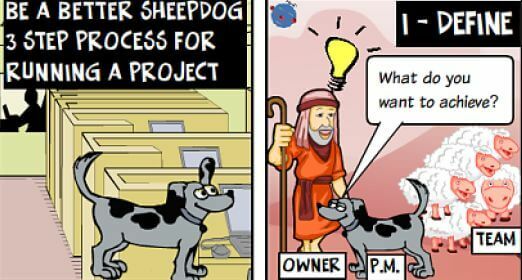 This is often call matrix management, I sometimes call it managing people with one hand tied behind your back :-) Despite this you still need to get the Project delivered dealing with any Issues along the way. This may need you to land some punches! What punches can I land? 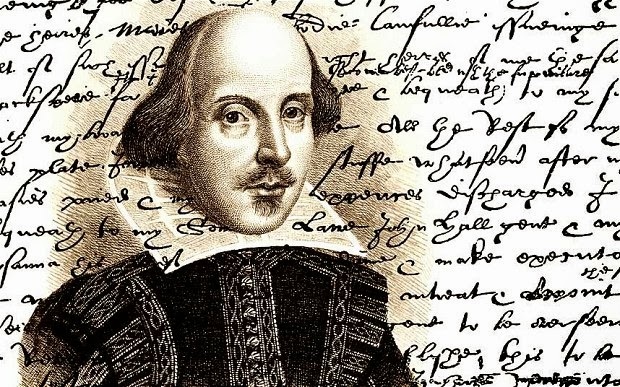 Like a fighter you need to understand "what punches can I land and where should I land them for differing impacts, sometimes to soften up, sometimes to put on the canvas?". So what are the possible punches? 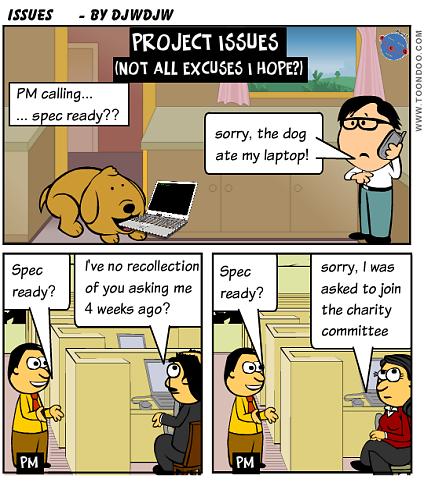 an informal chat with a Senior User because there is an issue with some business resources. The message might be "We have a problem with Fred who is not delivering to the agreed plan and is making lots of excuses. Can you please have a quiet word with him and get him on track else I am going to have to formally raise this at the next Board meeting?" 2) Establish an informal network of line managers for resources you are managing. This is often the first punch approach as a quiet word with the line manager may result in a change of approach by the "problem person"
3) There may be others possibilities in individual circumstances so put your thinking cap on, "how can I land a punch on this person or team?" OK, so you have identified your range of punches. But don't overuse and try your hardest not to use because they don't aid team spirit. Firstly, I will give the team / individual every opportunity to fix the problem I have raised through a discussion or two on a one to one basis. Secondly I will telegraph the punch by saying something like "if you don't achieve x by y" or "if I don't see a change in attitude by z" then I will need to <describe appropriate punch>. In this way you have given sufficient warning and this will minimise negative relationship impacts of landing the punch. But there will be some impact as nobody likes being hit! Hopefully the threat of the punch achieves the desired result but sometimes it doesn't. If it doesn't then make sure you follow through with the punch that you said you would throw else your credibility will be lost (you have cried wolf). 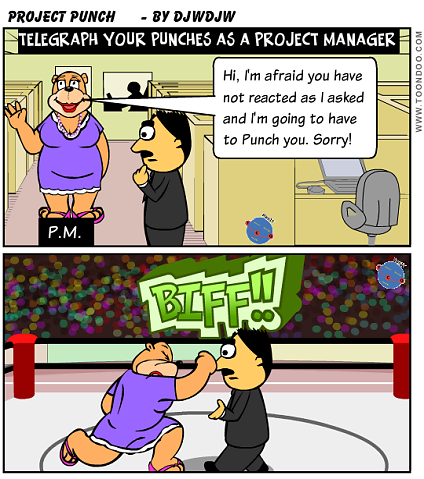 Who ever said Project Managers can't learn from the world of Boxing? So work out your Project Management versions of the jab, right cross, left hook, uppercut etc. Threaten the punch first and try to avoid using if at all possible - but if you need to, please tell the recipient that it is coming!